Doridina have a wide range of species, and by far tend to be the most photographed of all the sub orders. This sub order tends to follow the same format in each species too, whereas there are some bizarre looking species in the other sub orders that I found difficult to relate as nudibranchs. 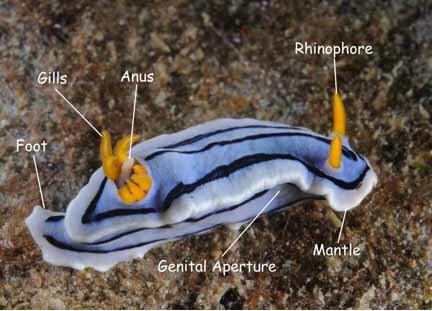 Key physiological points are shown using this example of Chromodoris lochi below.